Nicole's Needlework: My Next Start? I'm thinking of starting Christmas at Hawk Run Hollow. I got a few threads I was missing today. It's really tempting me! Here's a pic of Block 12 threads (since I always start at the bottom right). I have decided to go with 40 ct. Vintage Examplar (my all time favorite color of linen) instead of the regular Examplar. I forgot I had a fat 1/4 in my stash. I plan to save the regular for another project. I'm still working on "With My Needle." I have about five more rows of the words to do and I'll be done. Hopefully, I'll get it finished today or tomorrow depending on how much stitching I can fit in. And then.... Maybe I'll start CaHRH? Write soon! cant wait to see updates on this one! its been temptin me but its too large for me ...i dont think i would ever finish it! very pretty! Your pictures are always so clear & pretty! You go girl! Will love to watch your journey on this one! Of course, excellent choice to start next, Nicole. Looking forward to watching your progress on this one. I am going to love watching your progress on this! 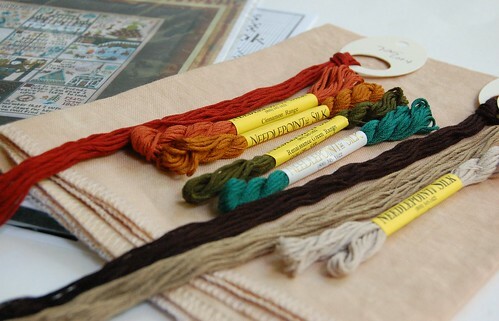 The colors of the thread and your fabric are gorgeous!! Start start start! Pretty please? Go, Nicole, go! I can't wait to watch from afar while someone stitches CatHRH. You'll be stitching it exactly the opposite of how I would, so that'll make it even more fun. You always pick the prettiest pieces to work on and the most lovely colors of fabric and threads. Can't wait to watch. I'm just curious, why do you always start in lower right corner? 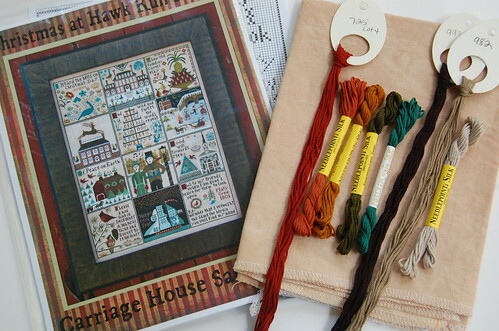 Your photos of charts, floss and linen are SO beautiful. They really show the colors better than any other shop site I have seen. The colors in the CHS Christmas are so pretty. I would love to see more inside of the Joyeaux Noel book! That would be a beautiful start, but then again, any of your starts would beautiful! I hope your son is better! Very pretty and of course I vote yes for the new start ;-). The colors are so pretty! Can't wait to see your start. That block should be an easy one to stitch too! I'm behind...but WOW!!! Beautiful wips....LOVE them all!! and what yummy new stash!! I'm nowhere near ready to start on CHRH, so I'll have to enjoy your progress! Love your With My Needle-think that's what it's called..BEAUTIFUL!!! Hmmmm. I think I like your fabric better than mine. It's not too late to restart. Oh, dear--what to do... In the meantime, I'll do something else. I'm glad I saw yours! I just got "Christmas at Hawk Run Hallow" last week from my LNS but I haven't started it yet though. Now I have every one of those patterns. There is another one that will be coming out called "Autumn at Hawk Run Hallow". I can't wait til I get that one. I can't wait to see your progress on Christmas at Hawk Run Hollow. I recently got it kitted up, but promised myself I wouldn't start until I finish Shores at Hawk Run Hollow - I'll have to live vicariously through your stitching!